Hi everyone, Steph Ackerman here showing you how to use the Bowdabra to create a fun pet bow. Begin by placing the Bow wire in the channel. Place the ribbon in the channel leaving a 4″ tail. Create a 3 loop bow. 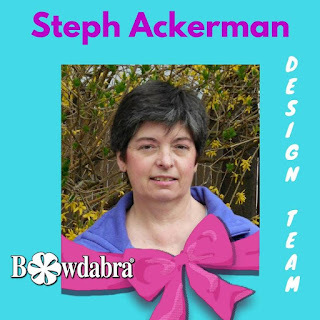 Use the bow wand to push the ribbon into the channel, then using a 1/2″ ribbon, create a smaller 3 loop bow. Fluff out the bow. The smaller looped bow snuggles neatly inside the larger looped bow. Tie the bow to your dog’s collar. Paulie wouldn’t keep it on, but at least he allowed me to photograph him with the bow!